All the space your large family or golf foursome needs for a magnificent North Myrtle Beach vacation is right here at Verandas 601. This North Myrtle Beach vacation rental boasts four inviting bedrooms. There are three baths in this North Myrtle Beach condo rental and with so much room, there is no doubting that eight people will be comfortable for a vacation here. This North Myrtle Beach condominium rental is on the oceanfront in the Ocean Drive section of North Myrtle Beach, South Carolina, an area popular for shag dancing at beach clubs. This condo rental in North Myrtle Beach, South Carolina has a well equipped kitchen with full-size appliances, cookware and dishes. The oceanfront balcony of this North Myrtle Beach vacation rental is quite the hang out, as it has amazing views of the Atlantic Ocean and white sandy beaches. You might be inclined to spend quite a bit of time out here where you can feel the sunshine and sea breezes. There is wireless Internet access in this North Myrtle Beach vacation rental and a washing machine and clothes dryer for your convenience. Verandas by the Sea 601 is at a marvelous North Myrtle Beach resort where an oceanfront lazy river, hot tub and sparkling blue swimming pool lure you outside. Spending part of each vacation day on the resort pool deck is a wonderful way to enjoy your North Myrtle Beach vacation. Who can resist a jump into the refreshing swimming pool or a relaxing whirl around the lazy river? 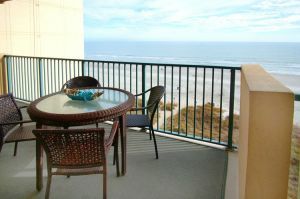 A fishing pier is nearby this North Myrtle Beach condo rental and more than 100 Myrtle Beach golf courses are in the area. This condo rental in North Myrtle Beach, South Carolina is also close to live entertainment theatres, shopping and dining! Go see a show at The Carolina Opry or take the kids to dinner and a show at Pirate's Voyage. There are two outlet malls in the Myrtle Beach, SC area as well as such popular shopping venues as The Market Common and Broadway at the Beach. And when it comes to dining, you never have to travel far to find a restaurant. With nearly 2,000 dining options around, food is everywhere.